Just as it sounds, repurposed content is taking old content and finding new creative ways to give it a new spin. This way you can extend the life of good ideas and solid research to fuel multiple avenues to reach your target market. This can be as simple as transcoding your work into other mediums; Combining multiple works into one, expanding on a previous idea, or breaking up your research into multiple ‘deep-dive’ style works. A good example of repurposed content is to look at advertising and how successful ad campaigns tend to recycle similar content to engage a specific market for a product that may not otherwise be appealing or stand out as being unique from its competition. A good example of a product that is not new and has value but also has a high level of competition is toothpaste. It is easy to explain the merits of using toothpaste and communicating these ideas to a target market but how do you not only identify with your audience but also clearly define why your toothpaste is better than theirs? 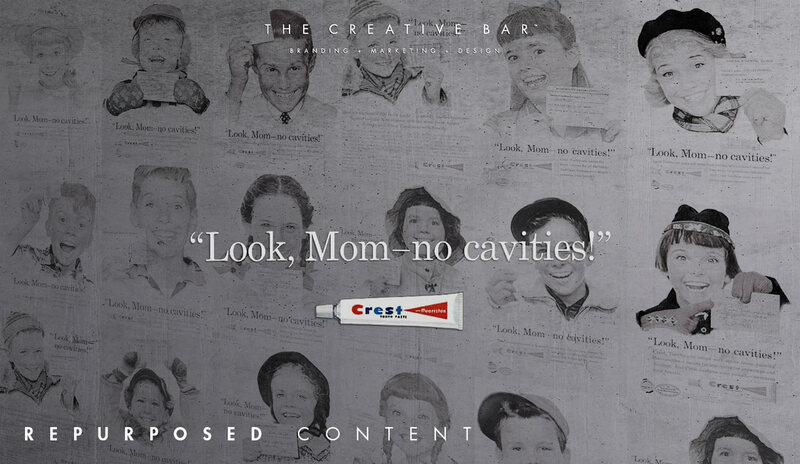 In 1958 Benton & Bowles launched one of Crest’s most memorable ad campaigns “Look, Mom—no cavities”. Utilizing a notable slogan with heartwarming Norman Rockwell paintings of cheerful children smiling while holding a check-up card from their dentist (“Crest,” AdAge). This slogan was depicted as a correlated statement since happy children with pristine smiles who used Crest did not have cavities. They never claimed that Crest actually prevented cavities in these children. Below, they stated all the benefits of using Crest because of their ingredient flouriston which simply evolved into the healthy happy smile equation. “Look, Mom—no cavities” Crest advertising campaign circa 1985, Procter & Gamble. 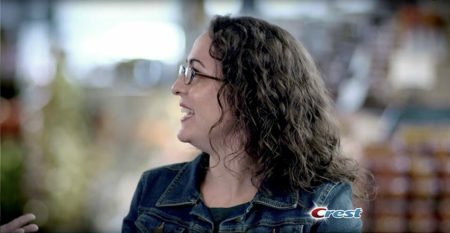 The combination of this notable ad campaign and Crest’s previous claims as being a “triumph over tooth decay” gained the attention of the American Dental Association. “At a congressional hearing in July 1958, the council’s assistant secretary said the Crest headline ‘Look, Mom—no cavities!’ was ‘at best both a gross exaggeration and a misleading distortion’ … That changed in 1960. In the Aug. 1, 1960 issue of the Journal of the American Dental Association, the ADA recognized Crest, with its stannous fluoride, as ‘an effective decay-preventive agent.’ It was the first and only toothpaste at that time to receive any therapeutic acclaim from the ADA. In effect, this announcement gave legitimacy to a product in a field with a history of unsubstantiated claims. Advertising could now simply cite the ADA’s statement that Crest prevents cavities” (“Crest,” AdAge). “Healthy. beautiful smiles for life” Crest HD advertising campaign circa 2017, Procter & Gamble. Whether it was purposeful or not, using an ad campaign to set in motion the process of vindication set forth over 60 years of advertising campaigns. 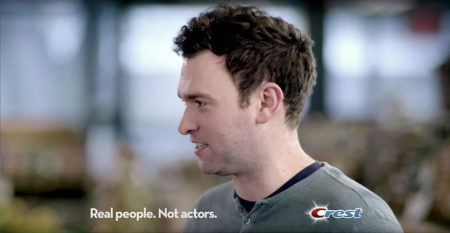 It continued to revolve around the simple fact that Crest toothpaste could say something that its competition couldn’t. This legitimated relationship with the ADA and the dentists by affiliation. 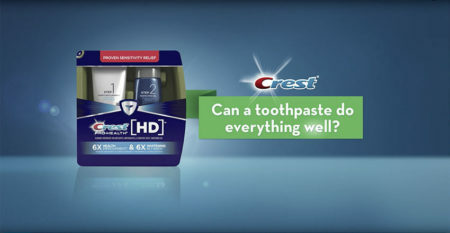 Inherently this lent Crest not only the value but the unique attribute of why their toothpaste stood apart from its competition. From the 1985 slogan “The dentist’s choice. 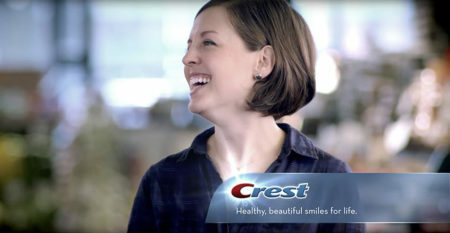 Crest protection.” to “Behind that healthy smile, there’s a Crest kid” in 1997 (“Crest,” AdAge), and “Healthy, beautiful smiles for life” in 2008 (“Smile When…” Adweek) there has been an ongoing connection to the original “Look, Mom—no cavities” campaign and Crest’s fundamental association with a healthy lifestyle. The culmination of Crest’s ad campaigns is a textbook example of repurposed content. 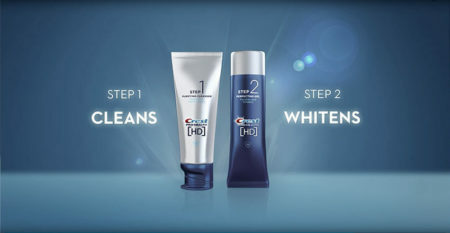 The idea stems from the interdependence of Crest toothpaste and cavity prevention. Furthermore, this led to a healthy and happy life and what better spokesperson to infer to for ‘healthy teeth’ than a dentist. Procter & Gamble has used this equation to build their toothpaste brand and to develop Crest into the brand it is today. Although this may have been a long-winded example of repurposed content, it is a thorough case study on an evergreen topic. An original idea that can be reinvented, transcoded, manipulated but remains a relevant topic that is as multifaceted as it is sustainable. From the audience of the 1950’s to the millennials of today, health and proper hygiene have and will continue to be an evergreen subject. Using repurposed content has a long list of benefits like reaching new segments of your audience that prefer certain mediums. Your current audience may be based on blog readers who visit your site regularly or through organic searches. Why not open up the spectrum with an infographic or video for visual people. You could use a social media campaign for socialites or a podcast to help extend your reach to people on the go. Transcoding for content over various mediums means you can extend your reach to a much larger audience. An audience you may not have had the attention of before. By repurposing content, you can enhance your SEO efforts. Think of it as building in support for achieving the conversions you are looking for. Revamping an old blog post or building around existing topics is a good opportunity to increase relevancy. Not to mention this method will also strengthen keyword strategies. This way you can repurpose content to build a network of supporting themes through different mediums. And as an added bonus this will increase the number of quality backlinks as well. Publishing multiple works in a variety of mediums and placements will raise the amount of authority you have on a given topic. Especially when a combination of unique content is blended with the repurposed material. In Google’s Search Quality Guidelines they state that E-A-T (Expertise, Authoritativeness, Trustworthiness) is among their top considerations for page quality (“Search Quality…” Google). It is important to carefully choose evergreen topics that are within brand expertise. This type of repurposed content is a great way to expand on the knowledge base your brand has to offer. If you had a post that performed very well but has become less prominent with age, updating the work and adding more versions that link back to the original will not only breathe new life into a solid topic but increase your brand’s expertise (& reputation) overall. When you have already put time and effort into a piece, expanding upon it can breathe life into an old topic. Refreshing it will open it up to a new audience that may have missed the original posting. Putting solid performers front and center is an easy way to repurpose content. This strategy will reinforce the message you are trying to convey to your target audience. Honestly, the idea of repurposed content should sound like an obvious move. Your next question should be, what makes good content to repurpose… Before we jump into methods let’s consider quality first. The best-repurposed content should stay within brand expertise, otherwise, all your efforts may fragment your audience instead of achieving conversions. Remember E-A-T? We want to build upon the foundation that your brand has already established. 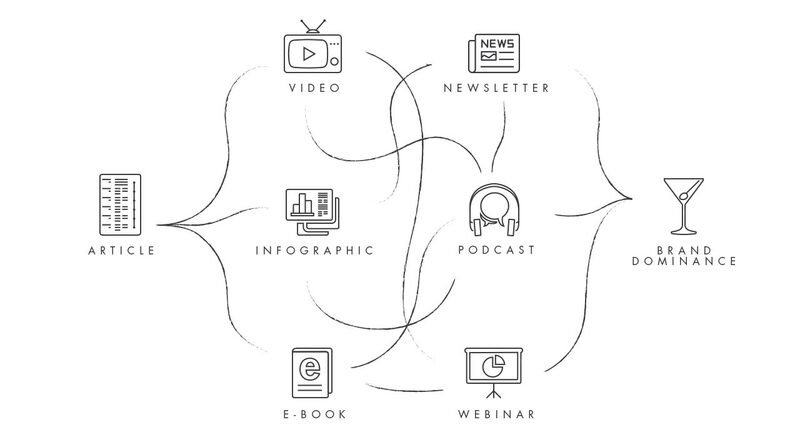 To build your information authority and strengthen your audience’s trust in your brand’s message we need to build a connection. Following are the best ways to sort through what you already have to find what can be repurposed smartly. Evergreen Content – This is content that is not only relevant, to your brand, but stays so over a long period of time. There is no point to repurpose a post on the hottest Christmas toys for 1985. This topic lost all relevancy within a few months. Topics that are time-based or passing fads are very unlikely to be searched for. While a post on how to make a certain Christmas toy will stay relevant for several years. Evergreen content is a perfect source to repurpose since it has the legs to not only last but to reach a larger audience. For more information on evergreen content read up here… What Is Evergreen Content? Strong Performers – Use Google Analytics to research which posts have done well in the past year. Strong performers are perfect options to be transcoded into new mediums. They can also be pushed in social media campaigns to give them a second chance to shine. These types of posts may have a limited lifespan which means acting on these sooner is paramount while they are still relevant. It is also a good idea to pay attention to why these posts did well. You can then use a similar formula for future posts. Insights into trending topics can influence what content you repurpose and how you implement it. Outdated Research – Is there old content that can be updated or expanded on? If the information has changed then you can republish the old content with new information. Another option would be to use it as a template for something new. Keep in mind that you can also repurpose research. When you have made an effort to collect and organize the facts then find new ways to break up the data into multiple posts. Another question to ask when looking at old posts is has your audience changed? or has your brand’s voice evolved? reformatting archived content may be another way to breathe life into aging topics. E-book; Pdf guide; Infographic; Video; Podcast; Slideshow; Webinar; Powerpoint presentation; Newsletter; Case study; Promote/share on social media; Printed collateral; Build a quiz. 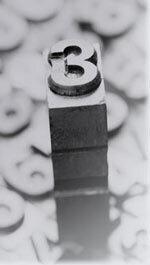 Everything makes more sense and appears more desirable in 3’s. The rule of three is considered the most persuasive number in communications (“Thomas Jefferson…” Forbes) as it is literally everywhere. Whether it is an unconscious appreciation or a thoughtful awareness, if you understand the power of three and incorporate it into your marketing, you will increase your success rate significantly (“Marketers Must…” Business Insider). Even in long lists of content, the reader will generally remember their top 3 points that connect with them. And all you have to do is simply make these touch points available to your audience. Repurposed content gives your brand the opportunity to engage your audience from a variety of channels daily. This is achieved through sharing content, interacting with users, and placing your content in more places. Then by transcoding your content over several mediums to capture more people who may be interested in your message. And the easy part here is – your audience will choose which three mediums that are the most effective for them. All you have to do is give them the option to understand your information in a multitude of ways. So even though that one blog post is performing really well, you are not taking advantage of making your brand’s message memorable. 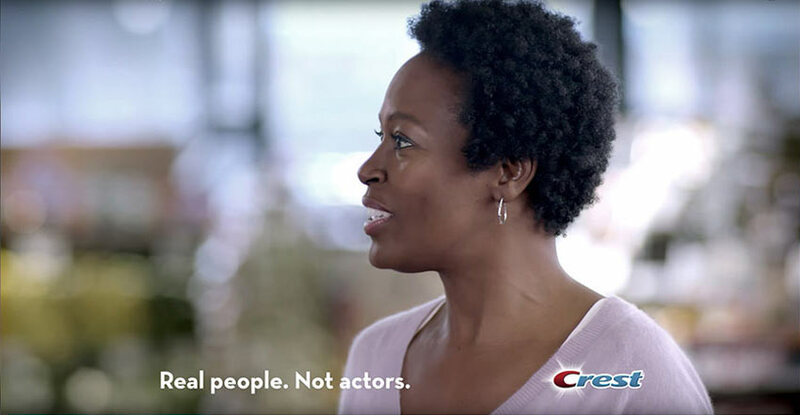 We all use toothpaste, hopefully… but how often do you think about your toothpaste? every day, twice a day, or very rarely. When it begins to blend into your daily life it becomes a staple that is simply routine. Branding is the cornerstones that divide and define competitive markets. We may not think too long or hard about why we use Crest over Colgate or why one is better than the other. Either way, we do end up identifying with the brands we choose. This relationship generally began for one reason or another but it is that rationale that we identified with. Crest established its brand principle early on and built a 60-year advertising campaign repurposing the same ideas that not only established their authority and expertise but also fed into the needs of their target market. Once this trust is built, a sway in any direction too far could jeopardize this relationship. Repurposing content is an efficient way to create more content that can reach a larger audience in a landscape of mediums. The key element to repurposing the right content is choosing within the brand principle and using topics that fall into evergreen territory. Although trending content has its place as quick reposts and promoted marketing to reach new audience segments, the prior is the sort of stuff that brands rely on to establish their dominance and build customer relationships. Time is money, so let’s make more money by saving time. Creatively repurposing content is a strong strategy to build your brand as well as keeping the relationship with your audience both healthy and happy.